The Dating Diaries – Yup. This blog is exactly what you think it is. Vivere Marie and Nova Moriarty are here to share the process of trying to figure out this thing called dating and romance. Seriously, the hell is that?! Nova Moriarty is an author of high fantasy erotica, and this blog is the epicenter of her book news and thoughts on writing. That moment when you spend 45 minutes looking through online and book resources for lessons on the topic you want to cover, then create a totally different activity from everything you’ve been looking at. #Teaching, right? More on this later, maybe. For now, school starts in 5 days, and I need to buy some quilt squares! And clothes pins. Definitely clothes pins. Anyone else out there have crazy vivid dreams? Because I do. Most of the time they’re great fun, and being asleep is like going to the cinema; I really wish there someone would invent technology where I could show someone else what I see. Alas, that remains in the realm of science fiction. Novel idea? I think yes. Anyway, nights like last night… they’re not the fun kind. They’re the kind that put all my anxiety out for the rest of me to experience it, two fold. Last night was a dream about rejection, the nasty gangrene kind that keeps me from ever putting myself out there. In my dream I was helping out with a photoshoot with a group of people for this guy’s album cover. He was killing it (and he was hot), but after seeing the first few concepts started in a grump because it wasn’t doing what he wanted. So I look at the photos and start making suggestions and adding encouragement that he could absolutely get the kind of cover shot he wanted. “That’s nice, but I’m not interested in you. You’re naturally blonde.” He shrugged and finished by saying, “Sorry, but it’s just the way it is.” And everyone else in the dream continued with the photoshoot without me. It was an illustration of one of my deeply held beliefs that if I find a guy interesting and attractive, he’s not going to even consider me… well, at all. In fact, I’ll be nothing more than a nuisance. I’ve been in all kinds of a funk all morning because of it, and it’s making it difficult to get into the heads of my protagonists for the next stage of Oblivion Veil. You know, the romance leads who get married to save their world? That. Sigh. Anyone know a good way to tell the subconscious to take a hike? Traditionally I dream about action-adventure movies. Those are way more fun. What deeply held anxieties haunt your dreams? I recently bought a house, the one I’m sharing with Nova at the moment. It’s old and adorable with lots of add ons, and it has more built-in storage than I’ve ever seen. I mean, the prior owners turned one bedroom into a hallway (you can’t get to the other half of the house without walking through the bedroom) but filled up a 6′ by 15′ section just adjacent to that room with built-in closets. Some of the closets are super deep, and since they’re dusty and periodically littered with broken toy bits (just picked up a quite elegant-looking doll foot…no idea where the rest of the doll is, but she wears classy sandals), I’m cleaning them out before putting anything in them. So, a moment ago, crouched in my four-foot-tall, three-foot deep hall closet, I thought, Huh. I’m in the closet again. And seriously, contorting myself to clean the closet I’ve stuffed myself inside? That sounds just like me. But at least I’m enjoying it! After having not experienced any feelings of attraction for so many years, it’s surprising to me how many people I have felt flashes of attraction toward during the past two months or so, now that I am listening to my emotions a bit more frequently. Remembering that I am allowed to feel attracted to people is still a bit of a conscious process for me — I have to explicitly self-talk my way into remembering that it’s not generally considered weird, creepy, or wrong to think someone is beautiful or lovely, provided you don’t stare or drool or stalk them or something because of it — but it’s coming a bit more naturally now, and I’m a bit shocked by how many people I simply didn’t recognize as attractive up until now due to how sincerely I had turned that part of my brain off. How much of the world have I been missing? I’m finding that I don’t usually feel attracted to every single thing about a person, as a “package-deal” sort of approach. Instead, bits and pieces of people’s appearances stand out — a raised eyebrow, a confident expression, a jaunting hip, an elaborate piercing. Sometimes those elements are on people I would expect, with my idealized sense of romance, that I could be attracted to, but sometimes they aren’t; I’ll be attracted to the dignified crinkles around an older woman’s eyes, signifying a lifetime of serious consideration, preparedness, and humor, or to the confident motion of a guy sweeping his arm around his girlfriend’s shoulders. (I already mentioned, in an earlier blog, how disturbed I have been at times when I was the object of that masculine confidence; I feel no desire to be the woman who is being embraced in that context. But attraction to that image and that motion? Yeah, that’s there. So probably I have some element of autochorissexualism (thanks for the word, Alex B!) mixed into my lesbianism.) When I really look at the world and listen to myself, there are an amazing number of things people do that make my chest cavity warm and my fingers ache for connection. The world is filled with amazing people doing amazing things. I don’t know how I missed it for so long. And then every now and then, multiple things come together in one person. A few weeks ago, now — I was afraid to write about it, because I was afraid I would break it with my words — I met a girl at a conference who made my insides do flippy-floppy things in a way I honestly had never experienced before. And from elements that I wouldn’t have thought would come together to create such an effect. I mean, sure — she was tall, athletic, and comfortably dressed. But she was also confident, and sure in her personality, with an easy smile, bold haircut, brushes of tattoos, and a penchant for sitting just a hairsbreadth closer than my typical sense of personal space would dictate. Conversation flowed, and she was beautiful and wonderful — and dating a guy, and living two states away from me, having just flown in for the conference. So not everything was perfect. But my interactions with her were so. far. beyond. anything I’d done before, with regards to my emotions. Looking at her, I thought, “If you were available, I would ask you out right now. I really would.” And I have never, ever thought that before. I could meet someone. It would be okay — it would be allowed — it would even be lovely if I met someone. I think that needs to be my mantra for a while. I could meet someone. And it could be a positive and wonderful thing if I did. I’ve spent the last three days putting down flooring in the big, old house that Nova and I are sharing. I’m installing click-together woven bamboo (with the help of a family member to ensure that I don’t cut any fingers off with the table saw), and it is amazing. I love it. Seriously, I’m thinking of going out and moonlighting as a flooring installer (although I am painfully aware that, as flooring goes, engineered wood installed ‘floating’ — i.e., without glue, nails, or other sticky substances to hold it to the building around it — is probably the easiest and least mess-up-able type you can put down, with the possible exception of carpet). It’s awesome. There’s just something about setting the wood together, pressing it down, and hearing it click together. The bamboo is engineered with little edges and lips, and when it’s set in the right position, it just ‘clicks’ into a puzzle-like formation. Keep going, and pretty soon (read: like three hours later), it becomes a walkable, completed wooden floor. Sure, it needs a lot of solid whacks with a hammer to make sure the wood is in position, because it’s easy to have pieces just slightly out of alignment and not realize it, but with some physical exertion and concentration, the entire floor comes together. It’s like solving a puzzle, except way more satisfying. Out of the way, tabletop puzzles! I’m building floors now. One of the most rewarding parts of floor creation is the exactness of the finished project. Once all the wood clicks together, it’s almost impossible to imagine the boards as the puzzle-edged, multi-layered miracles of modern engineering that they seem coming out of the box. The top layer is immaculately smooth except for careful, engineered waves of texture, emulating the flow of real hardwood in woven strands of supposedly super sustainable bamboo (although as with anything labeled ‘sustainable,’ controversies exist). But the sustainability factor isn’t the point. The point is — despite the mottled, weird edges coming out of the box, everything looks perfect once it goes together. It tickles me, then, given how much I love that click-together perfection, how disturbed I was when my first date, back in college, came together, externally, quite like that click-together bamboo. On the surface, everything was smooth and stereotypically perfect. But under the surface, my emotions felt a bit like the wrangled edges of that engineered bamboo, smashed together against some constricting, uncomfortable pattern and screaming to escape. My first date came about, almost by accident, in my sophomore year of college. I hadn’t dated during high school — see my earlier post about my attitude toward my middle and high school colleagues — and during most of college, I was far more academically focused than I was romantically inclined. I knew parties, football games, and wild dates were ‘supposed to be’ part of college, but I was also totally uninterested in them. I was more intrigued by my classes than I was by the idea of going on a bender, and I didn’t see why I needed to attend sports games to enjoy college when I had a mild hatred for the five-letter s-word. And dates? Well, I wanted to do those, but they were always somewhere around priority #16. I had club events and school and friends to attend to first. We’d met in a college club, and despite my shyness and periodic aversion to people, we’d become close friends. We had gotten to the point where we would go on long, long walks talking about anything and everything (and I’m proud to say that, despite the many ups and downs in our friendship, those walks still happen today), and we were on our way back from a local bookstore, which was about a 40-minute walk from campus. Now, despite my knee-jerk reaction against romantic relationships, I go all in on friendships. I deeply enjoyed this friend (we’ll call him Steve, and he’ll come up a couple of times on the blog…he’s actually one of the key reasons Nova and I met each other, but that’s a story for a different post), and I saw nothing out of place in taking a four-hour walk with him and discussing everything from politics to family to hopes and dreams to misspellings on street signs. Conversation flowed easily, we enjoyed discussing disagreements as much as agreements, and we shared a love of esoteric, geeky references, although his were more computer science−oriented and mine were more anime. To me, that said good friends. To Steve, that said potential romance. Looking at our conversations through a more romantic lens, I absolutely see how he came up with that. In person and at the time, I was floored. After some backpedaling and panicked thinking, I did, within the next twenty-four hours, agree to go on a date with Steve. And here’s the thing — it flowed perfectly. And it left me in panicked, terrified tears, not knowing what was wrong. We went out as a group with the school club we had met during. Then we went for a walk afterward, and I let him hold my hand. (Cue squiggly, frightened, uncomfortable things in my stomach — to borrow a description from Rhys Ford, butterflies with razors for wings.) I followed the script in my head. We wandered back to the dorm; we cuddled for a while, sitting on my bed. (Seriously. His arm was around my shoulders and we talked with my roommate. That was it. And somewhere inside, my guts were saying, no-no-no, weird-weird-weird!) Then I walked him out, and he kissed me goodbye. I went back inside, sat quietly for a few moments (my roommate had gone out with friends, and she later told me it was to give me some privacy with Steve), called a friend, and started bawling. On the surface, everything had gone flawlessly. We’d chatted, we’d been comfortable together, we’d shown some mild affection, and we’d ended the evening on a positive note. And by that point, my emotions were telling me, loud and clear, NO. But I hadn’t been listening. I couldn’t understand what felt wrong. I had followed the script for romance that I had in my head, both as a product of television and books and friends’ stories, and as a result of having written plenty of romantic fanfiction in my day. I knew what romance was supposed to look like, and by all measures, we’d achieved that look with our first date. Sure, it wasn’t a whirlwind romance, but that would have been out of character for me anyway. On a fiction level, we had created an appearance of sweet and sincere romance. But to my consternation, the appearance of romance hadn’t created the feeling of romance. And I simply could not understand why. So the goal has to be finding someone with whom the squiggly edges work well, not the surface paneling. But I think the goal also has to include knowing which of those squiggly edges can be comfortably compressed, and which ones need to be protected at all costs. Figuring out the difference between the “taking risks” edge (which was certainly compressed on that date), the “agency in one’s own actions” edge (which I was ignoring), and even the “attraction” edge (which was screaming out, in its own unique way, that it was not interested at all, at all! ), and figuring out which ones of those truly matter. The difficulty there? Just like we can’t necessarily see underneath others’ beautiful paneling, we can’t always see our own scraggly edges, either. Sometimes it takes a long time to feel out the pieces pressing up against our contours of self, and to introspectively construct the reality of who we are and who we want to be. Dates — failed and successful — can be stepping stones on the way to that knowledge, because they force us to think about ourselves in close connection with other people, and to ask ourselves: This person I am when I am with him or her… is that who I truly want to be? I am grateful to Steve, and to our attempted date, for helping me realize some components of myself that, while I hadn’t yet addressed them in depth, I still wasn’t ready to compromise. It took me a long time, and a great many conversations with Steve himself, as well as Nova and others, after that date to realize that my sexuality was a major component of my emotional response. But that one semi-perfect, semi-disastrous date gave me a pivotal moment from which to work on my own self-definition, as well as the motivation to do something about it. After all. Crying isn’t all that out of the ordinary for me, but sobbing as a result of a seemingly positive, not super eventful first date? That’s a little bizarre. As Nova said, “If you cry after a guy kisses you, that’s a really clear sign that it’s not working.” It wasn’t. And the depth to which “it” wasn’t working was an integral part of my decision to work on figuring out why, even though that figuring-out process took many experiences over a span of almost five years. The work is still ongoing. So you might say that first date, or more accurately my unexpected emotional response to it, was the impetus for this blog series exploring relationships and sexuality and how those two overlap with the person I want to be. I don’t want to be the person with the shiny, linked up surface connections — and honestly, I never have. I want to be the person with awesome, supportive and inspirational connections for the underlying intricacies. That’s why I form such deep friendships. It’s why I open my house to friends and ask them to move in for indefinite periods of time. It’s why I love people, and why I care. Perfect click-together surfaces are for engineered bamboo pretending to be hardwood — marvels of technology, cobbled together from quickly-regrowing substances and mass-produced with immaculate identicality. That’s great for floors. But for people? Give me the whorled gnarls of an old piece of oak any day. Give me the textured reeds of prairie grass. Give me the papery bark of a birch tree, littering the soil around the new sprout of a rose. Engineered perfection can stay on the floor. So, full disclosure: I don’t know what Sexuality Pet Peeve #1 and #2 are yet. I’m new enough to actually listening to and exploring my sexuality (see last Monday’s post…) that I’m still figuring out lots of the tricksy realities that accompany being an out and proud lesbian woman in one of the more conservative, rural areas of a super liberal state. But this pet peeve feels like a #3. It’s not quite infuriating enough to be #1, but it’s also not just the brush of annoyance that would go with a #26. So I’m going with #3. I’ll keep y’all updated as others arrive. Sexuality Pet Peeve #3 has arisen since I started suspecting my sexuality. For some reason, my preference for girls was easier for me to admit to potential male suitors than it was to close friends and family members (and perhaps even to myself?). I used the phrase, “Sorry, I’m gay,” or “Sorry, I generally don’t go for guys” to ward off unwanted attention from men for almost half a year before I began deeply interrogating whether it was actually true and working on acting on it. And, while I’m not hit on particularly often — once every couple of months, or so — I was surprised by the frequency of times that saying I was a lesbian did not immediately discourage male interest. I’m not really sure what the motivation behind this idea is. Most of the motivations I can think of aren’t particularly charitable — gross egotism, imagining that their masculinity will be the one to change my mind? Different understandings of sexuality from the one I hold, with the (seemingly super harmful) idea that people “choose” to be gay? Plain old disbelief or denial? Although there’s always the chance that they were just seeing through my comment to the uncertainty underneath, in which case, congrats to them for being more perceptive about my emotions, after thirty seconds of interaction, than I was. Or maybe, more charitably, they just believed in the fluidity of sexuality and realized that just because I labeled myself as one thing, that didn’t mean I would never sway to the other side of the arbitrary border. That’s totally true, and totally possible. But even if that was the reasoning, the communication of the idea was rather insulting. The frustrating request to reconsider also seems problematic on a deeper, less humorous note. Essentially, if we reframe this conversation, I had attempted to communicate, “No. I’m not interested.” Sure, I generally try to do so in a nice way, and explaining my sexuality is a strong way to use the time-tested It’s not you, it’s me approach, but it’s still a way of saying “no.” And suggesting that if I just reconsidered and spent some time doing what the guy wanted, I might change my mind? That sounds scarily close to some manipulative actions later in relationships, actions that have deep and terrible repercussions. It seems deeply problematic when rejection on either side — regardless of what gender says no, or for what reason — is met with cajoling and pressure to change. It seems a great understatement to simply say that those aren’t ingredients for a healthy relationship. Not at all. So, no. We can’t “just hang out” and see if my opinion might change. If you want to be friends, that’s a different matter — I am always open to forming new friendships, even if I might seem standoffish at first meeting. But am I interested in reconsidering my newly discovered sexuality for the sake of a guy who thinks I’m cute. Sorry. You’ve just run into Sexuality Pet Peeve #3 — and if you ask again, I’m liable to snap your head off. You’ve been warned. I had a moment of realization earlier this week. Here, I’ll share it with you in screenplay form. SCENE: Car, driving back to Nova’s house from a night out. Vivere has just finished writing an essay for a continuing education class, where she discussed the problematic nature of labeling in A Passage to India. VIVERE: Hey, so I found a couple of events on the LGBT community center — book clubs and movie nights and such. Wanna go? NOVA: Sure, sounds like fun. Is there something allies wear to those? VIVERE: I’ll buy you a button! I saw some really cool “Ally” buttons when I was surfing on Amazon for LGBT gear. It’s amazing how deeply you can agree with the video below… and yet how important self-chosen labels can be all the same. 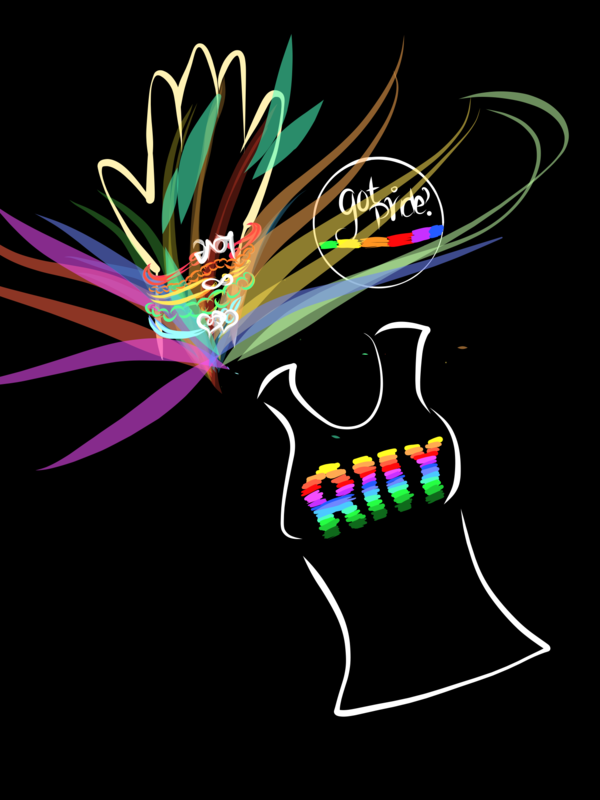 Nova has an awesome rainbow “ALLY” tank top now. I have a “got pride?” button and a rainbow bracelet (and some rainbow friendship bracelets I’ve been trying to weave and have been failing horribly at creating). We wear all of them with — what else? — pride. What labels do you choose to wear? How do you show them — and why?